To prep and cook the fish. Slice the fish lengthwise, to make smaller fillet pieces. Season with salt and pepper. Have 3 bowls ready with flour, egg, and panko bread crumbs seasoned with the spices. Make the toppings, set aside in bowls that will go on the table. Heat a heavy skillet, add a bit of olive oil and butter, and cook the fish until golden on each side, approximately 3 or 4 minutes per side (though this can change depending on thickness). The amount of oil/butter depends on size of pan – but it should be enough to get crust golden. While fish is cooking, heat the corn tortillas according to package instructions. 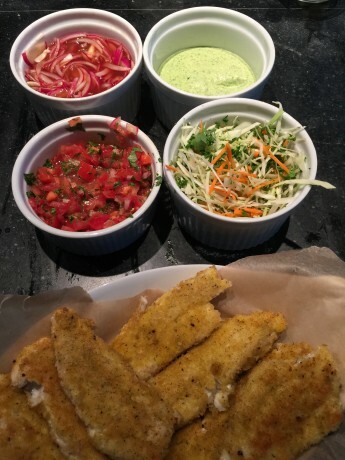 Place everything on the table – the bowls of toppings, fish on a platter and tortillas in a basket so everyone can help themselves. Combine chopped fresh tomatoes, seeds squeezed out, (Maine Backyard brand are good winter tomatoes) with 1 tablespoon or so finely chopped red onion and red pepper, some chopped cilantro, a minced garlic clove, olive oil and squeeze of a lime. Taste and adjust. In a food processor, add Hellman’s mayo, about a cup, with a handful of chopped cilantro (about half a bunch), minced shallot or garlic, pinch of salt and squeeze of 1/2 or 1 lime, depending on juiciness. Process until smooth. Taste and adjust. Combine thinly sliced green cabbage, maybe some red for color, and a grated carrot. In a bowl, dissolve 2 tablespoons sugar or brown sugar in 1/2 cup apple cider vinegar and 1/2 cup hot water and 1 teaspoon salt. Add a red onion, very thinly sliced, and let sit until pickled, 2-4 hours or more.